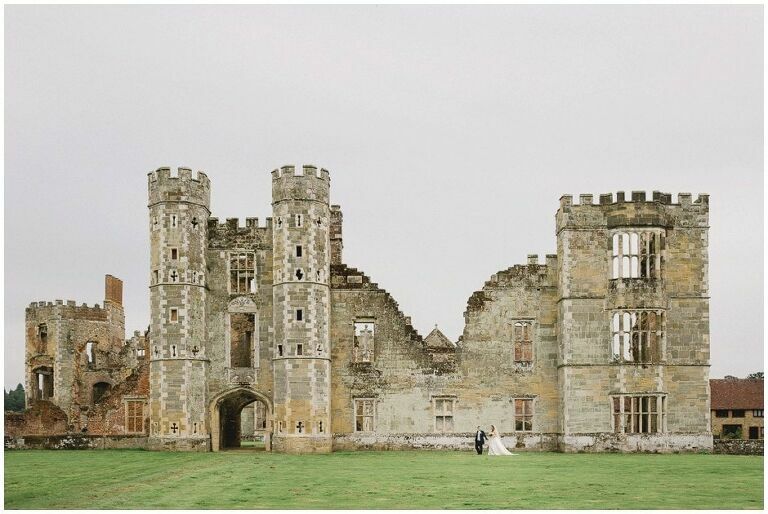 Celebrate your wedding day in your own Secret Garden in the magnificent grounds of Cowdray Park near Midhurst in Sussex – designed in the early 1770s by Lancelot ‘Capability’ Brown, the well-known landscape creator. Situated next to the ruins of historic Cowdray Castle, the gardens offer a beautiful backdrop for your stunning wedding photographs. The walled garden is alleged to have been a Tudor Pleasure Garden visited by Henry VIII and Elizabeth I, and now boasts turf benches, arbours, well thought-out paths, sweet smelling herbs, fruit trees (apples, pears and plums), roses, clematis, scented herbs and herbaceous beds enclosed by brick walls. All combine to create a unique backdrop for your afternoon drinks reception and photographic memories of your special occasion. Between 2001 and 2004, the derelict garden space was lovingly restored to become the idyllic wedding venue than we can see today – with colourful herbaceous borders, a tropical glasshouse featuring orchids and bougainvillaea, rose beds, vegetable beds, sculptures and fountains.